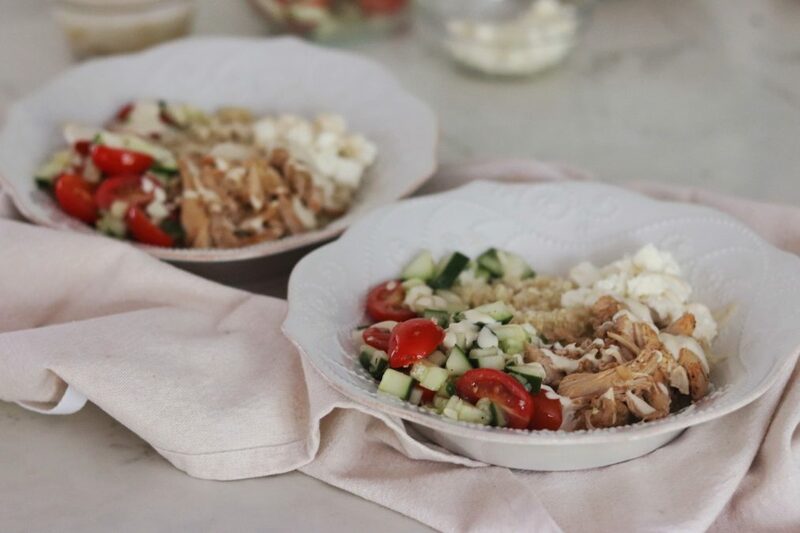 The bright, fresh flavors of the Mediterranean make these Instant Pot Greek Chicken Gyro Bowls a meal prep favorite in the Ivey house. When making chicken in the Instant Pot, I prefer boneless, skinless chicken thighs, which stay juicier than leaner chicken breasts. 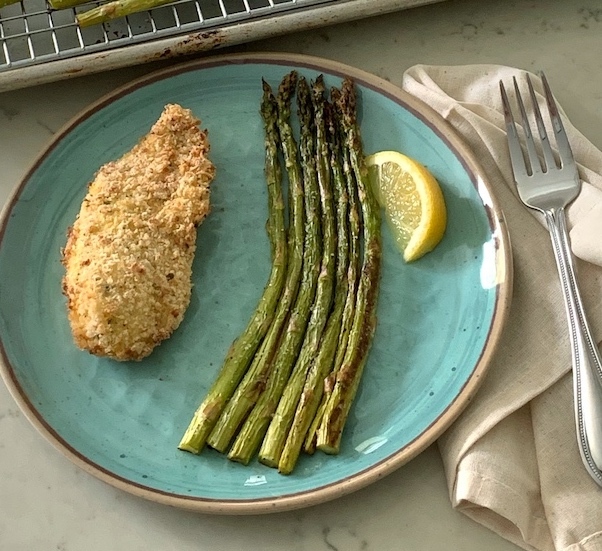 Searing the chicken first adds a depth of flavor that makes it worth the extra step. 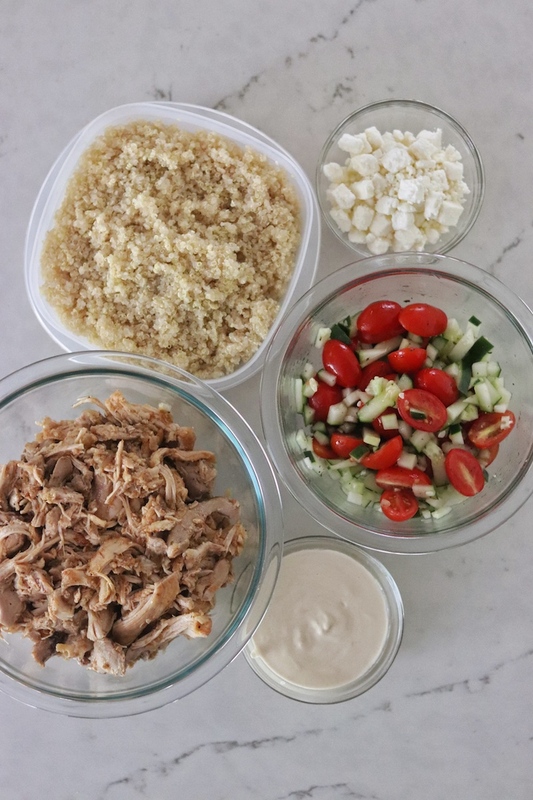 Prepare the tomato and cucumber salad and the sauce while the chicken cooks for the most efficient use of time. Tahini has recently become one of my favorite ingredients for making sauces and salad dressings. In case you’re not familiar with tahini, it’s a condiment that’s popular in Mediterranean and Middle Eastern cuisine and is used in several foods you’ve probably eaten before, including hummus and baba ghanoush. 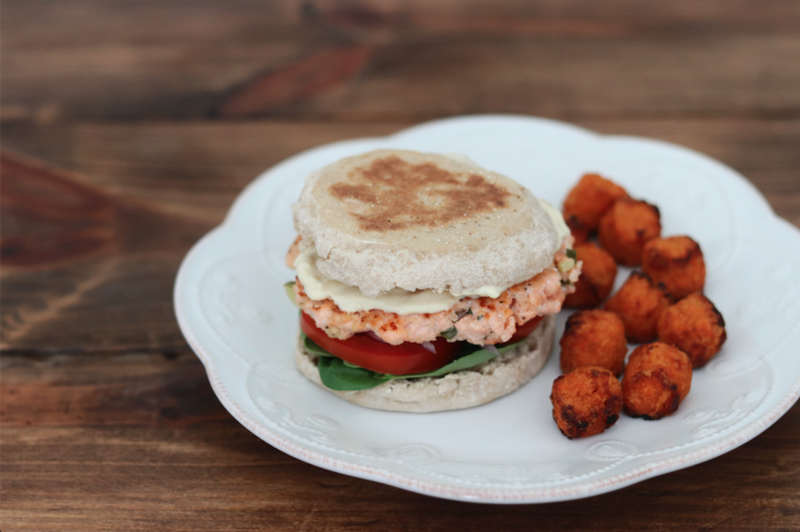 Most of the fat found in tahini is heart-healthy unsaturated fat, and it also provides plant-based protein. A generous amount of lemon juice makes this zippy sauce a flavorful drizzle that brightens up the entire dish. 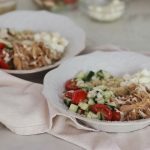 I chose to use cooked quinoa as the base for these bowls, but you could use any grain you like, such as whole wheat couscous, brown rice, or bulgur. 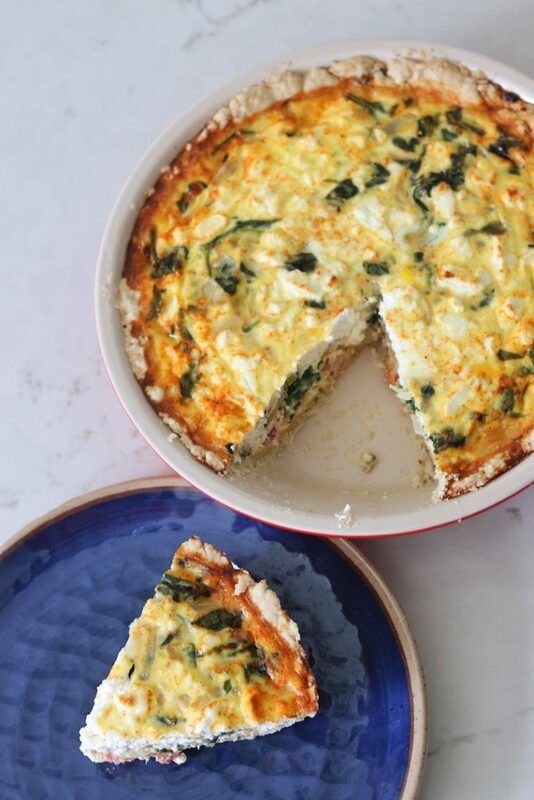 Whole grains have more fiber than refined grains, which helps to stabilize your blood sugar and also lower cholesterol. 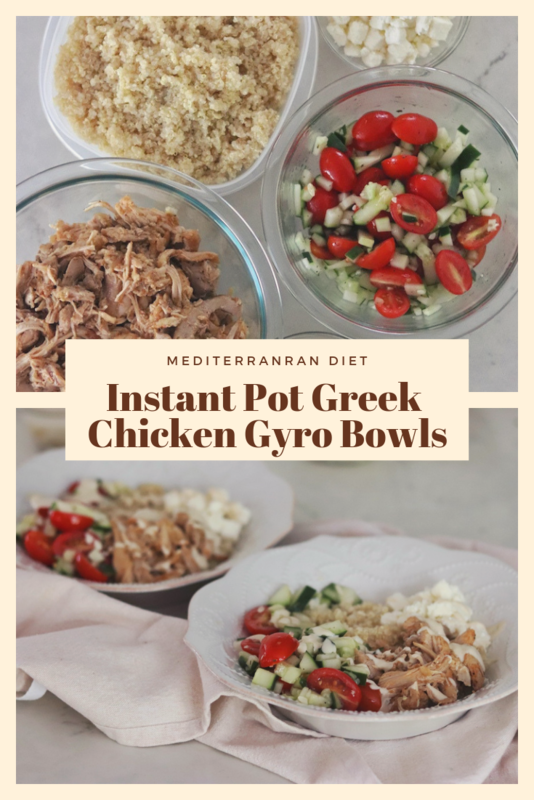 Make these Instant Pot Greek Chicken Gyro Bowls for dinner one night and package up the leftovers for lunch the next day. Leftover chicken makes a yummy filling for a wrap or pita with hummus, lettuce, and desired veggies. For the chicken: Turn the Instant Pot on to the sauté function and wait for it to get hot. Sprinkle chicken evenly with oregano, paprika, salt and pepper. Heat oil in Instant Pot, and add chicken, in batches; cook 2 to 3 minutes on each side or until browned. Remove chicken from pot. Add onion and garlic to pot, and sauté 3 minutes. Stir in chicken broth. Cover and seal. Cook on manual setting for 10 minutes. Quick release the pressure. Transfer chicken to a bowl with a slotted spoon. Shred with two forks, and stir in lemon juice. For the salad: Combine tomatoes, cucumber, oil, vinegar, oregano, salt and pepper in a small bowl. For the sauce: Stir together tahini, lemon juice, olive oil, honey, and enough water to make a sauce that will drizzle in a small bowl. 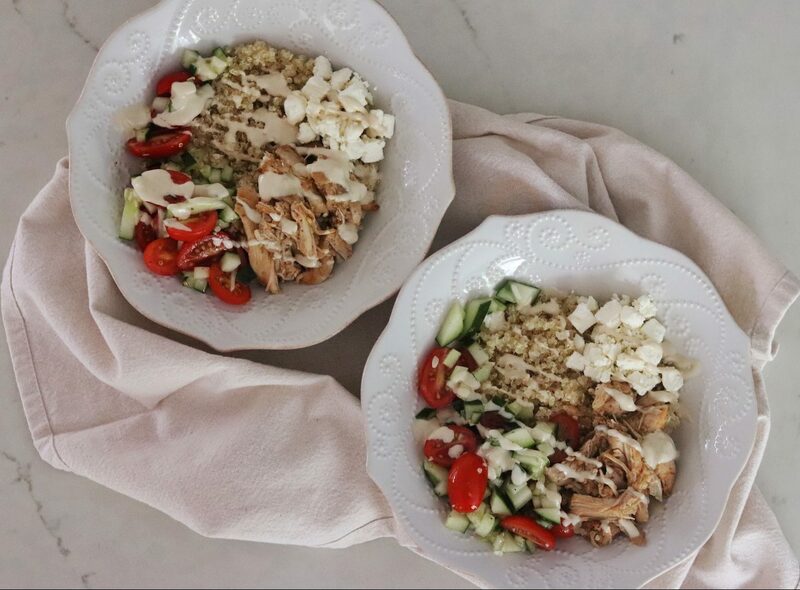 Fill 4 bowls evenly with quinoa, chicken, salad, feta cheese, and sauce. 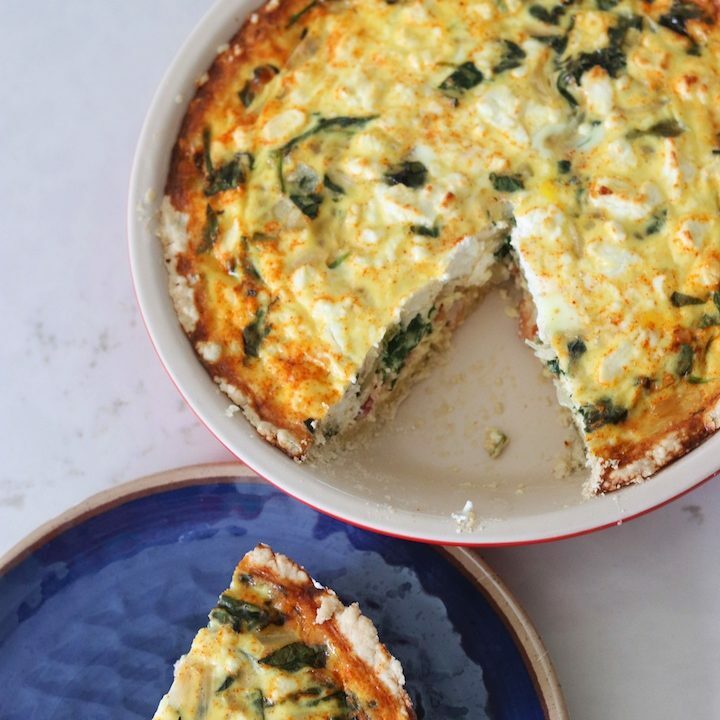 You will have leftover chicken from this recipe. Freeze in an air-tight container up to 3 months.